As I have said before, this blog is mainly concerned with events in 617 Squadron round about the time of the Dams Raid, but occasionally strays into other events during the war. This is another example! Flg Off Joe Merchant joined 617 Squadron as a bomb aimer towards the end of the war, and was in the crew piloted by Flt Lt Price on one of the squadron’s last wartime operations (and the last one in which it sustained casualties). He dropped the Tallboy bomb which blew a hole in the German pocket battleship Lutzow. You can read the story, written by Joe Merchant’s son Vivian here. 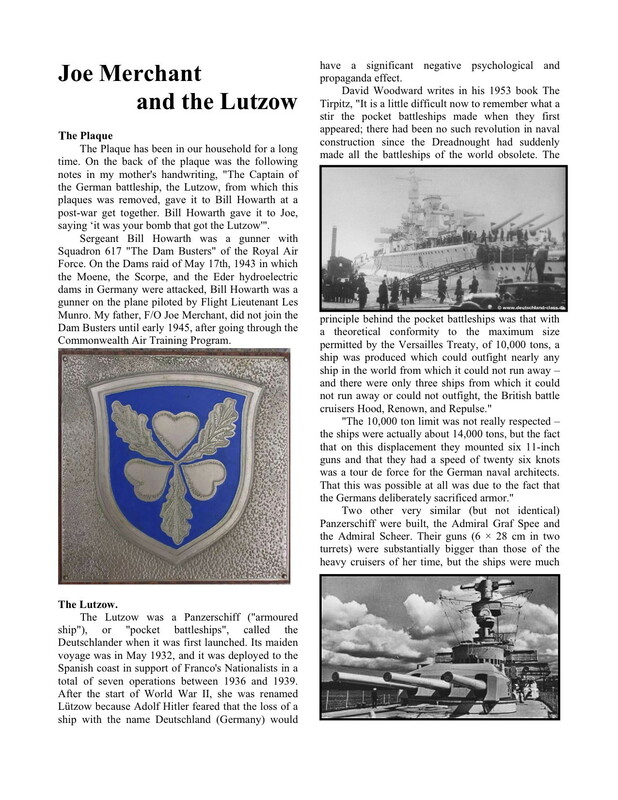 Great piece on the sinking of the Lutzow…….a question……were the Dambusters flying Lancasters or Halifax’s? My brother-in-law, Maxie Coles flew in Lancasters over Germany with the RAF and RCAF…..also delivered Mosquitos to fight Rommel in the desert…….he just celebrated his 90th year…..